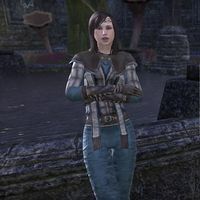 Adelle Montagne is a Breton member of the Mages Guild who can be found at any Mages Guild outpost across Tamriel after you have joined the guild. She serves to direct you to Valaste, beginning Long Lost Lore. "Greeting! I have a message for you from Valaste, Mistress of Incunabula." "Indeed! She has a task for you. You'll want to speak with her as soon as you can." "Valaste awaits you at the Guildhall in Vulkhel Guard, along the southern coast of Auridon." "Valaste awaits you at the Guildhall in Daggerfall, along the southern coast of Glenumbra." "Valaste awaits you at the Guildhall in Davon's Watch, along the eastern coast of Stonefalls." "Of course! What can I tell you?" "The Mistress of Incunabula for the Guild, the Keeper of Tomes. She's the guild's most accomplished loremaster, second only really to Guildmaster Vanus himself." "I don't, but she usually tries to offer new guildmates a chance to prove themselves. As you might imagine, she's keenly interested in acquiring new books for the lore library. Maybe she's got a lead on a trove of tomes?" This page was last modified on 20 February 2019, at 02:09.